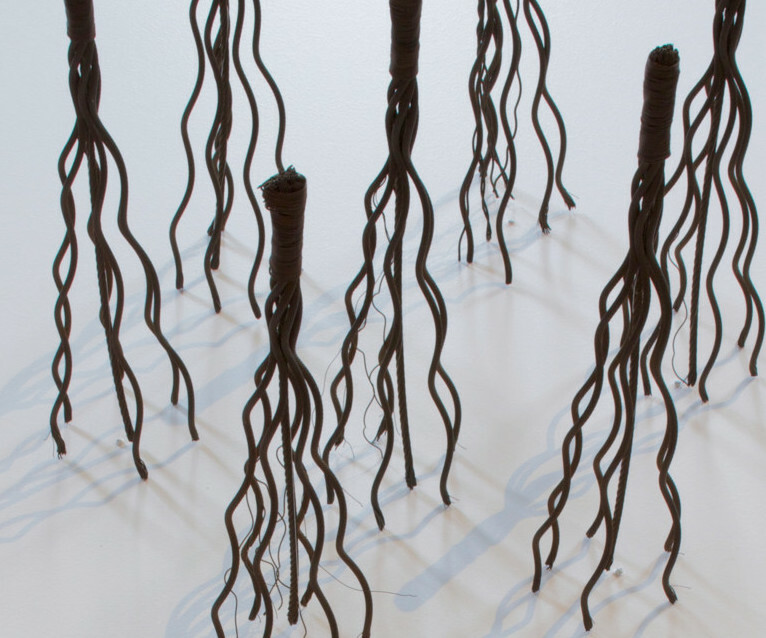 Walking, one of three related installation works, which include Whirling (1978) and Leaning (1980), is arranged directly on the gallery floor and is composed of 148, two-feet-high bundles of wire rope. Walking embodies both Hassinger’s sculptural practice and her interest in improvised movement. The title, Walking, a gerund of the verb “to walk,” emphasizes the viewer’s action. The arrangement of the sculptures necessitates a bodily consciousness on the part of the viewers, who must adjust their movement through the space. The body, and even the changing daylight, enacts a spontaneous shifting of light and shadow on the spindly, branch-like bundles. Maren Hassinger’s sculptures, works on paper, performance, and video examine the poetic tension between nature and industry. Engaging with the formal rigor of Minimalism, her work interrogates the reductive concept of “women’s work” and blurs the distinction between handicraft and fine art. Hassinger is among the innovative black female artists of the 1960s and ’70s, such as Faith Ringgold and Betty Saar, who experimented with culturally and aesthetically evocative media. Hassinger has used everything from petals and dirt to wire rope and plastic bags in her sculptures and installations. As an undergraduate at Bennington College, Hassinger studied dance and sculpture, though it wasn’t until she was accepted into the fiber department at UCLA’s MFA program that she committed to working in sculpture. She also continued to participate in numerous performances in Los Angeles through the 1970s. In 1978, the same year she made Walking, she collaborated with Senga Nengudi on a performance in which the two artists, entangled in pantyhose, illustrated how women are restricted by societal gender norms.